” Important recognition also came from France and the respected Automobile Magazine. The publication elected the Quattroporte the “Best Car” in the luxury berlina category in its 26 January edition. As Stephane Meunier, editor of the French monthly, pointed out, the Trident vehicle is the only car to have received this award of three consecutive occasions. This is testimony to the extent to which the Quattroporte is valued by the French public. To conclude, the Quattroporte was voted the “Best Car 2006” in the “Luxury” class by the Swiss magazine, Auto Illustrierte. The Modenese model took the prize for the second successive time and attracted 25% of the votes polled. This was almost 10% more than its nearest rival. They have a great article this month profiling what’s hip and what’s not. Dozens of the twin citie’s tastemakers were polled so who are we to argue with their results? Perhaps the ultimate accolade is that the CEO of CurtCo Robb Media owns a 90th Anniversary Spyder, while its Senior VP and Creative Director traded his Porsche for a GranSport! 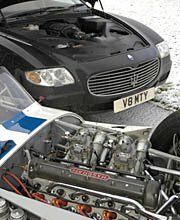 “Our profiled owner this month is a hero to many for both his “day job” and his well deserved reputation as one of the world’s foremost car enthusiasts. 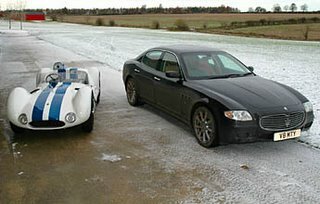 For him the choice of Maseratis was a clear one, and money really wasn’t much of an object. The drummer Nick Mason, you see, is a founding member of the rock group Pink Floyd; just one of their albums, Dark Side of the Moon, spent fifteen straight years in the Billboard Top 200, and has sold over 40 million copies. This is a fantastic article from AutoWeek about the current status of Maserati, as well as their future ambitions. ”Readers of Germany’s leading car magazine, Auto Zeitung, have voted the Maserati Quattroporte the best Imported Luxury Car for the second consecutive year. The Quattroporte far outstripped the second place Bentley Continental Flying Spur, with almost double the votes. “Maserati announced in Detroit the establishment of Maserati Master USA driving school. Modelled directly from the extraordinarily successful Master GT Driving School held at the Varano circuit in the mountains of Parma, Italy, the US program will provide expert driver training in Maserati products in an elegant setting. Twelve two-day and eight single-day programs will be offered beginning in March 2006. A total of eighteen participants will spend time in exclusively Maserati cars including the Coupe, GranSport and Quattroporte.